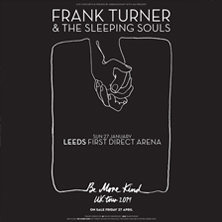 Frank Turner & The Sleeping Souls stop off at first direct arena, Leeds in 2019. He’s sold out a series of shows this year, on the first leg of the Be More Kind World Tour, as he prepares to release his new studio album of the same name in May. Page generated in 0,071690 seconds.